The RDD7 has an 800 x 480 high resolution screen with a 300:1 contrast ratio delivering crystal clear image quality on a beautiful 7" touch screen display that is easy to navigate. The GUI supports a wide array of features and functions. The touch screen surface makes navigating the menu items fast and. The status bar is always displayed with fixed home and back buttons making it easy to navigate from and to any screen. Our GUI is not the standard Chinese one from other cheap brands. Rockville had one of the best designers in the car audio industry design the GUI from scratch. The interface was designed in the USA in Rockville headquarters! Everything from Bluetooth to the radio to DVD navigation is designed in a user friendly way. 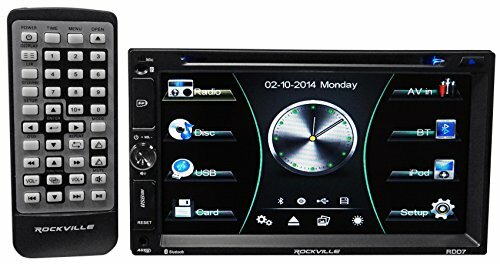 Rockville RDD7 7" Touchscreen Double DIN DVD/USB/SD Receiver with Bluetooth . 7" High Resolution TFT-LCD Digital Touch Screen. 800 x 480 Screen Resolution. Selectable backgrounds. 16:9 (Wide Screen) or 4:3 (Letterbox) Switchable Aspect Ratio. Bluetooth Capability for Hands Free with Phonebook and ADP2. iPod, iPod Touch, and iPhone (4S to 6S) integration via USB. Supports iPhone charging. Pandora/Spotify integration with iPhone via USB. USB Media Input (MP3, MP4, MPEG4, WMA, WAV, OGG, FLAC, APE). USB Media Input (MP3, MPEG4, WMA). Repeat / Program / Random / Intro Play on MP3 Play. FM / AM Receiver with 30 Preset Station Capability. Auto Memory Store / Preset Scan. 7 band equalizer, 60Hz / 150Hz / 400Hz / 1KHz / 2.5KHz / 6.3KHz / 15KHz. It Also Has 6 presets EQ curves in Addition to the Custom Curve Flat/Classic/Rock/Jazz/Pop/custom. Connect your compatible iPod, iPhone (4S to 6S), or iPod Touch with your device's USB cable and enjoy full music control and functionality directly on the receiver! The receiver will display album title, song title, and artist names. The receiver will also charge your iPhone when connected to the USB. Control Pandora or Spotify on your iPod, iPhone, or iPod Touch from the head unit via USB connection. Displays album title, song title, and artist as well as album art when available. The receiver is rated at 50 x 4 watts, which is extremely loud. This receiver will make your speakers super loud without having to purchase any additional external amps! The RMS power of the amp is 18 x 4 which is the same as the other leading brands in the industry. You can customize the unit from a selection of background wallpaper patterns or pictures which you can upload through USB. There is also a photo gallery you can view on the screen if you have photos stored on a USB or SD.